A reminder of things to know in the off season and prepping for 2017. Scroll down toward the bottom - we're in the "Carryover Selection" phase. You'll pay the 2017 salary for all the players you keep at this time and whatever's left is all you have for the Redistribution Draft and free agency - no additional cash to you until April. If you've got multiple teams, you can check the legal carryover status of all your team rosters. This link is also available on the multiteam tools page. There are 2 leagues with orphans that are private, prize leagues. On top of Benchwarmer fees, these leagues collect their own dues to pay out to league winners. See the "Invitation Only" section of the orphan list and look for Beer League and Murderers Row. If you're interested, let me know and I can get you in touch with the owners. Thanks for all your input on the potential rule changes for roster size / minors / carryover limits. So, no actual change is coming - the feedback plus some emails I received are pretty much in the theme of the current format works really well. There may be a shift to a 4-man taxi squad...but let me consider that for a few more days. There are a few changes likely coming to the league startup drafts but I need to test some more web page changes to make that work - that's one reason why the due date for the draft for Home of the Brave League is pushed back into January. Week Thirty Transactions posted. This is the 2nd of two fall trading periods. I've verified position updates and whether players in the minors still played in 2016 for most of the minor leagues - but I still need to check through about 115 minor league free agents. So far, about 150 players, including a handful of players on rosters, were pulled from the game (I'll post a list of those removed from rosters later this week). I'll now be checking current MLB 40-man rosters - and players on those rosters not yet in BWB will be added by the end of the month. We now move on to the stretch run on your carryover selections. The deadline for cutting down to 28 or fewer players is Sunday, December 25 - Monday, January 2 at 11:59 PM EST. Possible rule change on roster sizes and number of players to carry over each winter? See the outline of the changes and provide any feedback you might have. Deadline for the current trading period is extended - now set for Friday night, December 16 at 11:59:59 PM EST - Any open trade that had an expiration date at the deadline on 12/13 was automatically extended out through Friday night. Week Twenty-nine Transactions posted. Week 30 deadline (2nd period of fall trading) is Tuesday, December 13 at 11:59 PM EST. Deadline would have been Sunday 12/11, but I'll be out of town with no access to a computer, so I'll pass on the extra 2 days to you. You should also be working on your carry over selections, particularly if you have multiple teams - the deadline for cutting down to 28 or fewer players is Sunday, December 25. Save 10% - Black Friday through Cyber Monday - Season Tickets are $265 instead of $295. Play as many teams as you want in 2017 for less than the normal price of 6 teams. Offer good November 25 - 28. You can check your total due for 2017. Reminder, if you're paying for single teams you can save $5 per team if you pay during the first 2 weeks of January. Reminder that before you can do any trading or pick your carryover players - indicate if you're keeping each of your teams in 2017. You must answer "yes" before you may submit any trades or before anyone can contact you for trades. Deadline is December 11 or we assume the unanswered teams become Orphans. Trade deadline for the first of two fall trading periods is Sunday at midnight Eastern. You do not have to worry about going over roster limits for trades right now since you all need to cut down to 28 players in late December. Players who have positions with an "x" at the end still need to be verified - it will probably be early December until that's complete. First step before you can do any trading or pick your carryover players - indicate if you're keeping each of your teams in 2017. You must answer "yes" before you may submit any trades or before anyone can contact you for trades. Deadline is December 11 or we assume the unanswered teams become Orphans. Trades are now open - you have until November 27 for the first trade session. The second session will extend through Dec 11. You can also begin choosing your carryover players - visit your team roster(s) for a link to do that. Final deadline is December 25. Teams have been given their 2017 cap cash (the actual distribution is enough to get the team in your league with the smallest cash balance up to the cap level). Things to know now that the postseason is complete - and prepping for 2017. Prepping for 2017 - I'll be working on player salaries and positions for next season. Within the next week, I'll have set up your options to indicate if you are keeping your team for 2017, new orphans, and allow you to start setting your carryover players for your roster and trade with other teams. Neither team has previously won the Benchwarmer Bash - however, both Jesse (twice) and Tom (once) have won the Bash with different teams. Final Result: Crumption defeated Oklahoma 4-1; Congratulations Jesse! Benchwarmer Bash - Semifinals Games 5-7 posted. (1-4 posted earlier today). Bash finals coming on Friday. Benchwarmer Bash - it's going to be Tom Twomey vs Jesse Roche in the finals - we just don't know with which teams. Both owners have 2 teams in the Bash Semifinals...each playing against himself. 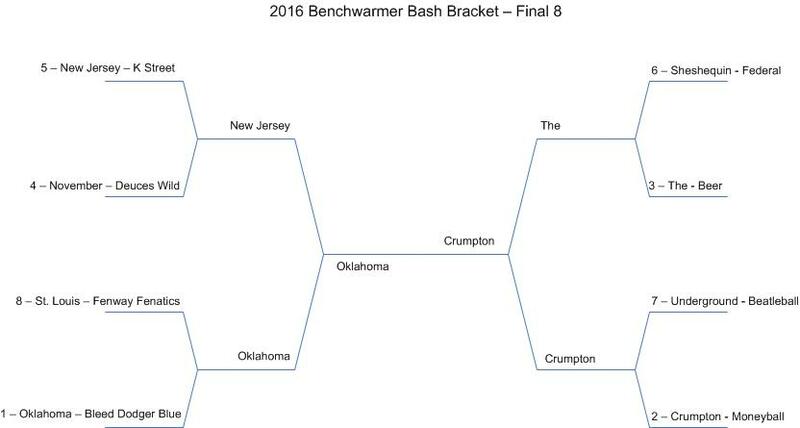 The 8 Federation winners now move on to the Benchwarmer Bash final bracket. Details will be posted probably on Tuesday, with games likely starting on Wednesday. Things to know continuing in the postseason - and prepping for 2017. If your team is headed to the Benchwarmer Bash - you can do one final lineup adjustment that will cover that whole tournament. Deadline is Tuesday night, Oct 25 at midnight Eastern. Of last year's finalists in the Benchwarmer Bash - winner Towanda Teetotalers (Commissioners League, Jay Snyder) was the one Fed champ that did not finish in 1st place this season. But runner up Lake Erie Storm (Cleveland Rocks, David Henning) did win the division again this season. Lineup deadline - if you want to change your lineups for the 2nd week of the playoffs, the deadline was extended to Wednesday, Oct 19 at 7 PM Eastern. Of 176 division winners in 2015, 91 repeated with division titles this season. 50 of the division winners from last season finished below .500 in 2016. From the 176 divisions that existed in 2015, 38 division winners are franchises that never before won a division title. Of the 44 league champions in 2015, 31 of them repeated as division winners. Things to know headed into the postseason - and prepping for 2017. While BWB takes a few days to set up the 2016 playoff pages/brackets, look for some news and notes here on the home page to recap the completed season. This season, there were 7 divisional ties. In 2015, 5 divisions ended in ties - how did those teams fare this season? Seven division ties to break- Results are in!!! Quahog won 5 of 6 head to head during the final three weeks. A final update on the close races for division crowns throughout BWB just before we move into the last 2 games of the season. Jose Fernandez has been removed from all rosters. With the unfortunate death of Jose Fernandez, by rule he will also be removed immediately from BWB rosters. This will be effective Week 26, the first week of playoff games. Within the next day or two, he will no longer appear on those rosters. Page fixed - the Standings in Previous Seasons page (also linked from Current Standings) now shows 2015 standings. TRADE DEADLINE!! - Thursday night is the last chance to make trades this season. Deadline is extended to midnight Eastern time. The next transaction/lineup deadline is extended through Friday morning at 7 AM to allow you more time with contracts. Contract extensions for 2017 and beyond are due Friday 7/29 by 7 AM EDT. See the extension page for information including rules or tips, or just go straight to the contract submission form. All teams have been given their July cash distribution of 1 million Benchwarmer Bucks. We're done for now with games in your division - the next 8 weeks of games are outside the division before we return to divisional matchups for the final 3 weeks of the season. Expect Week 14 transaction results on Sunday morning or afternoon. And then the first set of Week 14 game results by Sunday night - Monday night. Week 16 - deadline Thursday 7/21 - your chance to rearrange your starting rotation without concern for number of days of rest between Weeks 15 & 16 - our "All Star Break"
Need to make up some ground? The next 3 weeks - 18 games - are all within your division. First round draft picks of 2016 are now in the player list. You can sign them this week. Slight risk in signing draft picks - if the player does not sign by the MLB deadline (mid-July? ), the player is immediately removed from your roster and from BWB. How to find the picks? On the player selection screen, use the "Other" filter and you'll find an option for "First Round (2016)"
Early warning - the Week 13 transaction/lineup deadline will probably be moved ahead 1 day from Friday, July 1 to Thursday, June 30 as I'll be traveling over that weekend and can't rely that I'll have web access or time to work on processing. So the first week to sign them will be Week 12 - with a Friday, June 24 deadline. That gives you a couple weeks to figure out who you like. Dan Foley's latest BWB post on From April Till Fall looks at three of his underperforming teams - and realizes they are one-dimensional. Delayed link on my part, but check out Dan Foley's most recent post about BWB on From April Till Fall - in which he stresses the importance of a good bench. The first 3 weeks of games were all within your division. Now, for the next 8 weeks, you'll play teams outside your division. A few years ago, we had a couple of owners serve as "official" BWB bloggers, and it lasted a couple of seasons. Well the idea is back. Dan's going to include some posts about BWB - you should check out the first post - an overview of the game and how Dan came to it. If you have a similar interest, whether that's promoting the game, recapping your seasons, providing strategy hints, or something else you'd like to share - contact me and we can set something up. Hey - have you paid your 2016 bill yet? See your payment status. Unpaid teams will be locked out of transactions beginning next week. Transaction order from here on out is based upon the current standings, it generally will be updated a day or two after a week completes - and the Week 3 picking order is now correct and current. So we need to wait until all teams play MLB game #6 to get to BWB game #1. If the weather holds, Cleveland plays their game #5 on Tuesday and game #6 on Wednesday - so the earliest we'll get a score for Game 1 will be Thursday night. We shift the deadline day throughout the season to keep the BWB 6-game weeks better aligned with the MLB 7-game weeks. Deadlines on weekdays will always be 7 PM Eastern. For those in the Pacific time zone looking for later deadlines, if I were to set a midnight Pacific deadline time, it would be on the previous day (so our upcoming Week 2 deadline would be Saturday night, not Sunday afternoon). As is, this gives some additional time for news to break that may affect your decisions, plus in most weeks it allows me to process the transactions on the same day and open up the next week more quickly. Deadline Monday 4/4 at 11:59 PM Eastern - Week Zero Reminders - include maximum cash balance of 5000 heading into season, a cash distribution of 2000 to everyone, and you must have a legal roster after this week's transactions! Setting your first week's lineup is not due until April 10. Transaction order is now reset for Week Zero - this same transaction order will be used for Weeks 1 & 2, then we start using win-loss record each week to set the order. We're not going to draft any more new leagues for 2016. If you have a leftover bonus team, we'll let you carry it over to use in 2017 if you'd like - or use it to pick up an orphan team for this season. This is fantasy baseball 365 days a year. Teams are continuing preparations to get their teams ready for the regular season - first, they picked up to 28 players to keep on their rosters and now are going through the Redistribution Draft of available free agents - that's an annual draft held with advantages for teams who finished at the bottom last season. We're no longer drafting new leagues in 2016. But, if you'd like to attempt to turn around a struggling team, these orphan teams are available...pick up an existing team and rebuild it, rather than start from scratch. Are you already a BWB team owner and want to add teams? Check first to see if you have an available bonus team from 2015 or else add new teams here. Email us if you want an orphan team and we'll set you up. All teams have legal rosters - Startup draft is now complete! You'll enter into normal weekly transactions as soon as we process this week on Sunday night or Monday. I should also be caught up now on all PayPal payments (I need to poke through the mail and tally up any checks, so some of those may still be pending). Whenever an orphan team goes unclaimed and is still in control of the BWB Office on July 1, that team will receive its extra 4 million in cash at that time. That's it for the draft - we're now on to our normal weekly transactions that include free agent signings, cuts, and trades (contract extensions available in March). Redistribution Draft - modified lists for Rounds 3-5: Deadline is Sunday night 2/21 at midnight EST. You don't have to make changes - but it's an opportunity to readjust your list and add more players to get you more chances to fill your roster. Deadline - Sunday night, Feb. 21 midnight EST for Rounds 3-5 - this is the final adjustment - we'll run the 3 remaining rounds of the draft at one time. If during Round 2 processing, we had to move up players from later rounds in order to get you three players, all the remaining picks were moved up in order, so you should be set automatically with someone in Round 3, Pick 1 and beyond. Redistribution Draft - I'm trying to wrap up choices for orphan teams on Monday night but also have some concerns about several people with no picks yet...current extended deadline is TONIGHT - Monday night 1/25 at midnight EST. Any incomplete picks will be flushed out of the system - you can do your part to save me extra work on your behalf by clearing them yourself from the all my picks page and clicking "Clear incomplete picks"
Five Boroughs League Draft. Phase One Draft complete! Rosters now updated with drafted players - finances modified - and the Phase Two draft is now open. Forgot about this - the Transaction Order for the Redistribution Draft is now correct - the playoff teams from last year draft in the final four spots with the league champ last. Shadowball League - the issue with one team's carryover selections has been fixed - carry on with the Redistribution Draft picking. The 2016 Redistribution Draft is now open. You nearly 3 weeks to make your selections (see the link on your team roster). Deadline is Sunday night 1/24/16 Midnight EST. So close - 2 people still need to get legal rosters that were due Sunday night. Second of two possible extensions - to 8 AM EST Monday morning 11 PM EST Monday night. Let me know if there are extenuating circumstances and I can push out maybe another hour - however, roster cutdowns have been open almost 8 weeks - since November 11, and we''ll be moving on and making cuts for you tonight if it's not complete. Meanwhile - all rosters are open until 11 PM EST - if anyone else has last-minute changes or reconsiderations. Assuming all goes well - and all teams get to legal status tonight - cuts will be processed/posted Monday night. Your list for the Redistribution Draft will be due in 3 weeks - on Sunday, January 24. See the 2016 season calendar. TONIGHT!!! The deadline to cut your rosters down to 28 or fewer players is tonight - Sunday, January 3 at midnight EST. If you've got multiple teams, you can check the legal status of all your team rosters. This link is also available on the multiteam tools page. All the "no responses" to coming back have been converted to orphan teams. This should be the final list of orphans for 2016 if you're looking to use your free bonus team on an orphan. For any orphan requests on Saturday - I'm likely not going to be able to set them up until Saturday night - but you should have at least 24 hours to get the carryover selections finished before Sunday night's deadline (midnight EST). I will try to get back to B Movie Actor League draft resolution by Saturday night (but I have my own carrovers to complete plus the orphan teams).